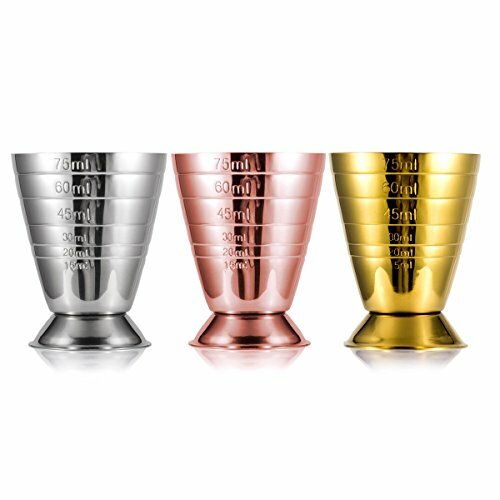 3 MEASUREMENTS-Homestia professional 2.5oz cocktail jigger engraved 3 units of measurement in Ounce, TBSP, Milliliters around the cup wall. Multi-level measurements mark in 1/2 ounce (15ml/1Tbsp), 1-ounce (30ml/2Tbsp), 1-1/2-ounce (45ml/3Tbsp), 2-ounce(60ml/4Tbsp) and 2-1/2-ounce(75ml/5Tbsp). It is more tending home bars and just one jigger meets your different measuring needs in complex cocktail drinking recipe to get a proper consistency. ENGRAVED MARKINGS-We introduce etching technique to mark the measurement easier to read. You will not be afraid the measurements missing after several use or frication. Also deepened lettering increases friction and stops it fall. PREMIUM MATERIAL-Made from 18/8 grade 304 stainless steel, durable and solid. MULTICOLOR SELECTED-Use is the another key condition that you should definity consider. The appearance of this single jigger offers a brilliant mirror finish. We supply 3 color to choose, simple silver, new fashioned rose gold and twinkling gold. Any color can elevate the look of your barware tools. Unscented and innoxious color plating make you rest assured to use. MATTERS NEEDING ATTENTION-Just silver dishwasher safe, gold and rose needs to clean with cloth. If you have any questions about this product by Homestia, contact us by completing and submitting the form below. If you are looking for a specif part number, please include it with your message.